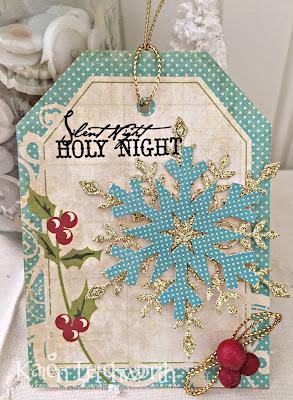 Well, you guessed it....I'm back today with another Christmas Gift Tag. Today's tag was inspired by Jen Carter's fabulous tag shared on Day 6 using Lil' Inker Designs products. 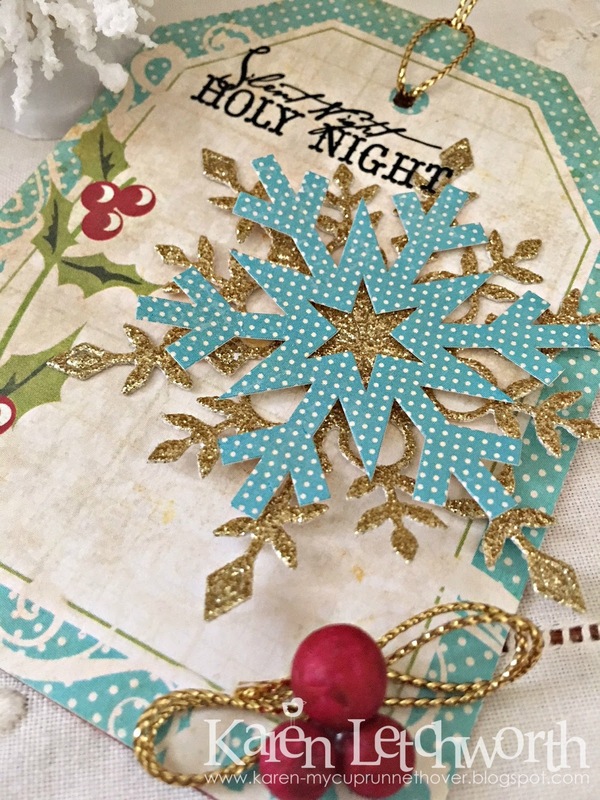 What really caught my eye on Jen's tag was her use of the blue/teal paper combined with the gold snowflake. I thought it was a fabulous combination, and I really like how it turned out on my tag as well. Thanks for the great inspiration on this one, Jen. My tag uses a tag from Season's Greetings by Echo Park. I also cut a Simon Says Stamp snowflake and layered it with a sticker from the same Echo Park collection. I also added some Gold Metallic String and some red berries. The sentiment I used (Silent Night Holy Night) is a Melissa Frances rub-on. It's really a pretty simple tag, but I really love this sweet color combination. 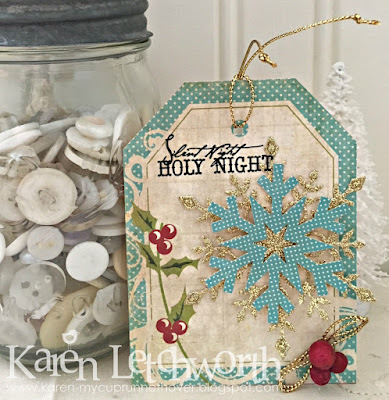 I love the holly berries printed on the patterned paper, but I wanted to give my card a bit more dimension; so I added a few holly berries of my own down at the bottom right. I placed some more of the Gold Metallic String under them to tie in the piece at the top of my tag and the gold in the snowflake. 25 Days of Christmas Tags - As explained above in more detail, my tag was inspired by a tag shared by Jen Carter on Day 6. Don't you just LOVE that gold snowflake against the teal blue? CropStop - Challenge #34 - Once again, I used the fabulous Towbow Adhesive and May Arts string. Simon Says Stamp Wednesday Challenge - Simon Says "Snow White" - Well, you can't have snow without a snowflake. Right? The Cat's Pajamas - Challenge #341 - Tag You're It - I don't have any TCP products to use, but I sure wanted to play along. Oooo, another gorgeous tag! I love the blue and gold together and the shabby-vintage feel of your tag! So, so pretty! So happy you linked this up to Cropstop -- love it when you play along! Karen, this is gorgeous with the teal and gold and that wonderful touch of red you've added. I love the big snowflakes. I think this is my favorite tag. Thanks for inviting me to play in the tag challenge. Love the vintage papers and awesome design. love tags and this is awesome. This is beautiful, Karen. The gold snowflake is amazing.